I hope everyone had a good Holiday weekend. I’m working through it so we can go camping this week. We always go camping the week AFTER Memorial day. We are the kind of campers that want to get away from everyone! Even in New Mexico, that is impossible to do Memorial Day weekend, so we wait until Tuesday when everyone else is back at work. I’m writing this blog ON Memorial Day and remembering all the brave men and women who gave the ultimate sacrifice for our country. I was in the military during Desert Storm and personally knew a few of those people. I will never forget them, their sacrifice or the families they left behind. Painted guitar in progress, Strat body. 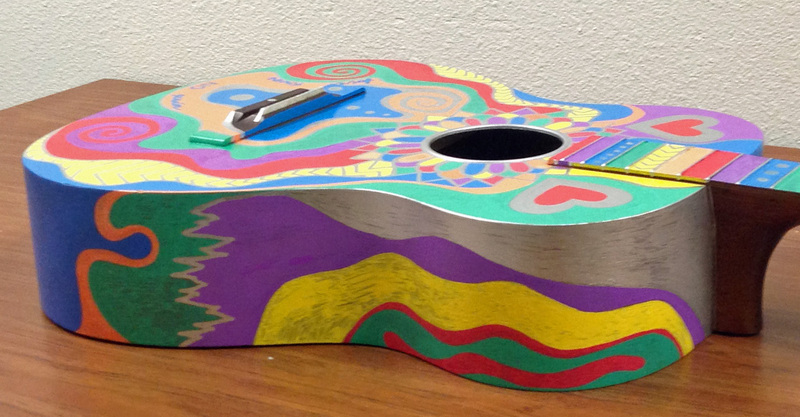 Over the weekend, I started my guitar painting for the Sierra Club show in August. I’ve had this Strat body sitting in my studio for literally YEARS! It has been patiently waiting for me to make it beautiful. It is still in progress and I’m hoping to make this one my first playable guitar painting. I’m counting on my husband to help me with building the guitar from the empty solid body it is now. I’m showing only recycled art at the Sierra Club, because what better place to promote recycling, right? Mural design, 12 x 12″ oil on canvas, this will be painted at 10 times the size of this painting! On Friday, I will be getting started on the mural project I’ve been writing about for the last couple months. I have created the design and have approval to get started! I’m really excited about painting LARGE! 10 x 10 feet large! I plan on making a time lapse video of the whole process so stay tuned. I may share bits and pieces of it during the process. 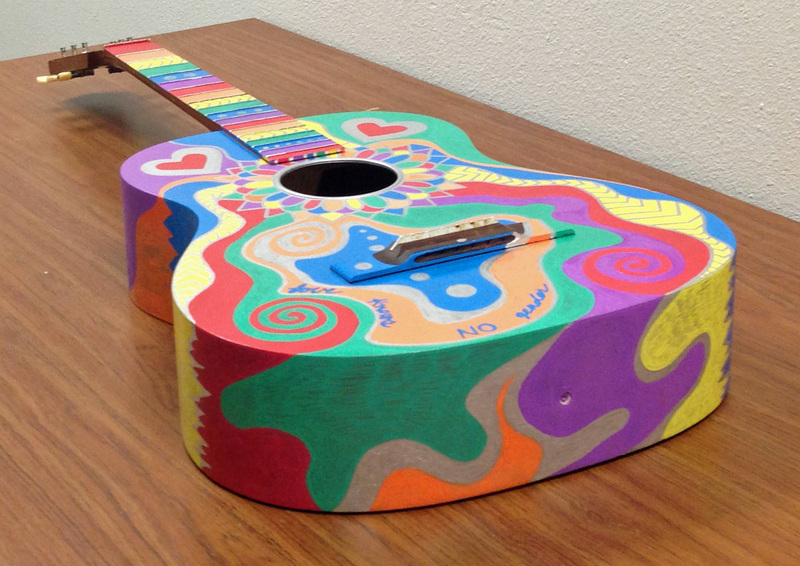 “Love Knows No Gender”, acrylics on full size wood guitar, still not quite finished but CLOSE! 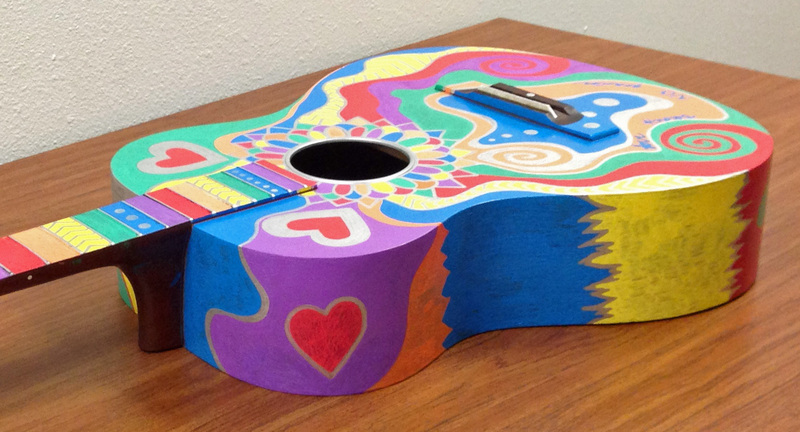 I’m just about finished with my latest guitar painting! “Love Knows No Gender” is dedicated to all the people who are STILL fighting for equal rights in this so-called equal and free country we live in. I BELIEVE in marriage equality, YES I DO! LOVE should be the ONLY prerequisite for marriage! PERIOD.